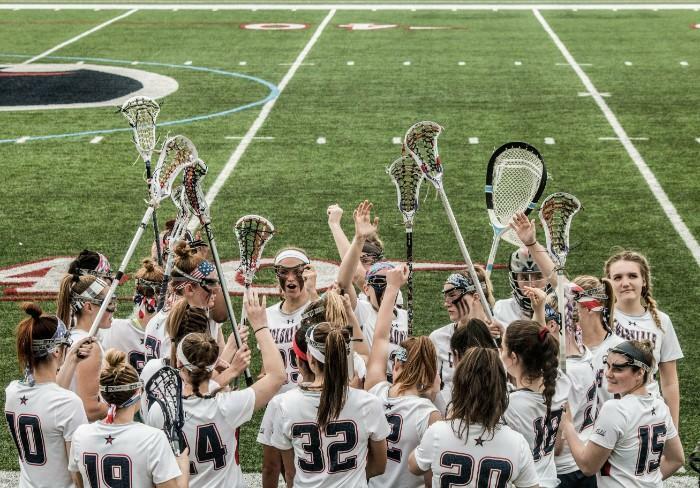 MOON TOWNSHIP– The Robert Morris women’s lacrosse team (8-4, 1-2 NEC) took on the Red Flash of Saint Francis University (3-8, 0-3 NEC) on a rainy Friday afternoon. Both teams come into Joe Walton Stadium energetic and eager to play despite the weather. Kerri Sayrafe of RMU scored nine goals in the contest. Let’s see how the action played out. Melanie Gandy made a beautiful pass to Mackenzie Gandy from behind the net to give the Colonials a 1-0 lead early in the first half. That was Mackenzie’s twenty-seventh goal of the season. The Red Flash quickly tied the game up at 1. At the 20:22 mark in the first, Clio Kerr scored to make the game 2-1 in favor of the Colonials. Shannon Lynch tried to go high to score, but the Red Flash denied it. Saint Francis put pressure on the RMU defense but were unable to score. A free position goal was scored by for the Red Flash, and they call a timeout shortly after. Halfway through the first half, RMU took a 3-2 lead thanks to Kerri Sayrafe, her ninth goal of the season. Two minutes later, Sayrafe scored again with an assist from Shannon Lynch. This built up RMU’s lead to 4-2. Sayrafe soon scored her third goal of the game off of a pass from Melanie Gandy with 11:25 left in the first half. The Red Flash quickly responded with a goal to cut the RMU lead. Sayrafe seemed unstoppable, as she put another goal in the back of the net, her fourth goal of the game. This put RMU ahead with a comfortable 7-3 lead. Kelley Flynn made a beautiful pass to Thalia Zolis shortly after to put the Colonials up 8-3. SFU soon cut the deficit to four after an unassisted goal at 6:33. With 2:26 left in the first half, the Colonials held a 9-4 lead. RMU’s ninth goal was scored by Mackenzie Gandy, with an assist from her sister, Melanie. Sayrafe’s sixth goal of the first half put RMU ahead 10-4. Kerri Sayrafe opened up scoring at the beginning of the second half as well. Melanie Gandy scored off an assist from her sister, once again showing the connection the sisters have on the field. The Colonials led 12-4 at this point. Kerri Sayrafe could not be stopped, as she scored her sixteenth goal of the season, and her eighth goal of the game. A goaltender change was made after that goal, with freshmen Jamie Keller now in the action. Sophia Eureka scored her twelfth goal of the season to make the score 17-5 Colonials. With four seconds left in the second half, Kerri Sayrafe scored her ninth goal of the game, which is now a new RMU record. The final score at Joe Walton Stadium was 18-5. Robert Morris will follow up their first conference win by heading to Fairfield, Connecticut to take on Sacred Heart (2-9, 1-1 NEC) on Thursday.